How did you find your Creatiques Experience? I had only spent one day shopping for my wedding dress prior to visiting Creatiques, where I decided to head out by myself and head into wedding dress shops in Southampton on a whim hoping that I could find something. It was a disaster day where I ended up coming back feeling very disheartened and let down particularly by the service that I received in some stores (one place, which will remain nameless, actually told me that I was too fat for a certain dress and don’t even think about buying it!). I felt like I never wanted to go near a wedding dress specialist again and was certain that I should find something online instead. My mum advised me that wedding dress shopping should be a much lovelier experience than that and that I should take more time to research. Living in Southsea, I drove past Creatiques one day and was immediately drawn in by their beautiful windows and decor. I went home and researched online, booking an appointment for the weekend and this time ensuring that my mum would be free to come with me. The moment that we walked into Creatiques, I knew that it would be different. My mum and I were treated to a lovely experience where I wasn’t rushed at all. I had also gone into the shop believing that I wanted a dress that would make me look like Stevie Nicks in bridal form but from the great advice that I received in store, I ended up going for a Justin Alexander style that much more demure and it suited me so much more. I walked away from that appointment feeling great about myself and my choice – like a bride should feel. This amazing experience and service was evident every time I went back to Creatiques for fittings etc. after that. 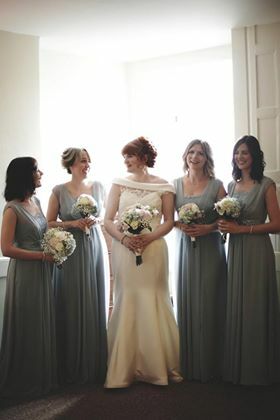 What really made it all so special was having Andrew and Rob present on the morning of my wedding – Andrew beautifully styled my hair to suit my dress and, when it came to the time, they both helped to dress me all the while having the best fun with my bridesmaids, mum and photographer. It was like a big party getting ready that morning and they really did go above and beyond what I ever would have expected. Thank you so much. Favourite Moment whilst planning your big day? I decided to be a bit cavalier and arrange my own floral bouquets for the big day. I felt that it would either be the best idea that I ever had or the absolute worst but after a LOT of Pinterest research and a morning of supply gathering, I invited my bridesmaids to my mum’s house for an evening of bouquet arranging and prosecco. We had the most loveliest evening arranging the bouquets and produced the most fabulous results. Each bridesmaid had individual bouquets that reflected what they wanted and they had clubbed together to create a fantastic bouquet for me. It was such a fun evening of bonding that I’ll never forget and every time I look at pictures of the big time I’m reminded of it all. Highlight of your big day? Can I have two? I don’t think Rich and I would realise the impact that the ceremony itself would have on us, I think we were both more excited about the partying afterwards than the wedding itself! 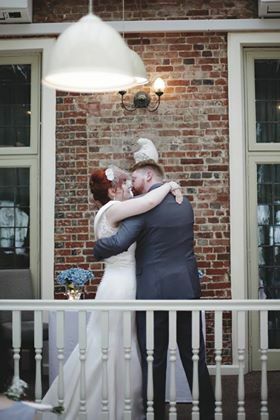 However, from the moment that I walked down the aisle to meet him to walking back down the aisle holding his hand, everyone else in the room could have melted away as it really did feel like it was just about the two of us and the great thing we were doing there and then as well as what was to come. Secondly, my mum was the best highlight of the day. Not just for me but for so many of the guests too. The night before – she saved a near catastrophe, the morning of the wedding – her presence helped to keep me calm and she was immediately there when I got all wobbly after putting on my dress, then throughout the day and into the evening – she spent time with every single guest; getting to know them and making sure that they were having a great time. 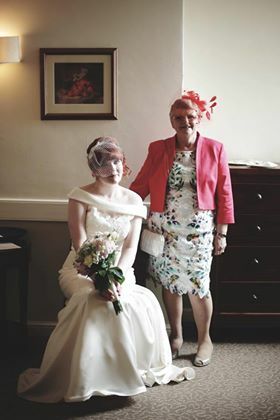 I mention my mum particularly as a few short months after the wedding she was unfortunately diagnosed with stage 4 lung cancer. Following a short battle, she passed away in March 2017. The memories of her from my wedding day are so precious to me now and I cannot think of my big day without automatically thinking of her and how much she gave to it, how much everyone enjoyed her and how much she enjoyed it all herself. I feel very lucky. If you were to re-do the whole day, would you do anything differently? I don’t think there’s anything at all that I would change or do differently. It was the most loveliest day in all ways. Top tips for future brides? Be mindful of the service that you receive from suppliers and vendors. If you find it not up to standard, do not be afraid to go somewhere else or be adventurous and try to do it yourself. In terms of my dress, I would have never have found my perfect dress if it weren’t for the high quality of service and experience that I received at Creatiques. Also, I was persuaded to arrange my own bouquets following three different occasions of rudeness from three different florists – my theory was that I could up spending £500 or more on flowers that wouldn’t be exactly what I wanted and were being provided by a supplier that I didn’t have full confidence in OR I could take a risk, do it myself for a more affordable price and have some fun doing it. As a result, I had a memorable evening with my best girls, had bouquets that I actually liked and was proud of, and only spent £50 doing it.